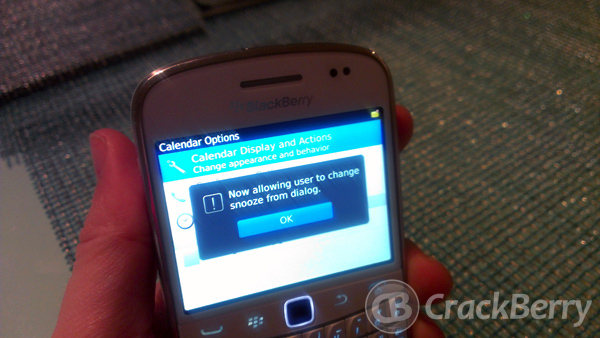 New BlackBerry Tip: How to change the Snooze time for calendar reminders directly from the popup! Normally you do not have those arrows on the Snooze button. With this shortcut, you will! When it comes to calendar popup reminders (as seen in the photo above), you normally have three options: Open, Dismiss and Snooze, with the Snooze time being a default time that you set within calendar options. It is not adjustable within the popup. That's it. From there you *should* get a popup saying "Now allowing user to change snooze from dialog" as shown in the photo below. If this doesn't work for you, try holding down the Alt key while typing acsz. Having this feature enabled now allows you to scroll through the snooze times whenever you get a calendar reminder, so you're not stuck with the default time. And if you want to disable this functionality, all you need to do is repeat the steps and things will go back to the way they were. I tested this out on quite a few phones, and it appears this even works all the way back to OS 5.0. So that's it. Set a test appointment and try it out for yourself. This is a no brainer to have enabled. 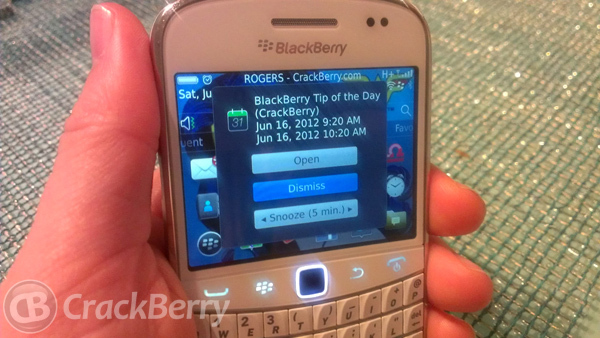 Be sure to spread the word and tell everybody you heard it at CrackBerry!